Srinagar: – After months of speculation, a top IAS officer from conflict-torn Jammu and Kashmir resigned from his service on Wednesday and indicated of his plans to enter politics in the region. Shah Faesal, who emerged as a youth icon in the state after he topped the UPSC exam in 2010, surprised many, particularly people outside the state of J&K, by announcing that he is quitting from government service to protest against the “unabated killings” in the state. The resignation of IAS topper Shah Faesal baffled some and amused others in his native state. TwoCircles.net spoke to a cross-section of society regarding his decision. Tariq Ahmad, a teacher from North Kashmir, called Shah Faesal an ambitious personality. “His decision to join mainstream politics is only going to be beneficial to the major political narrative. For him, his decision is right because he felt a bureaucratic handicap in the system,” said Ahmad. Saqib Magloo, a Srinagar-based Journalist said Faesal had a history of ‘gimmicks’ and that he had long been implying that he was going to join politics sooner or later. “For Kashmiris, it wasn’t a surprise given that they know their politics well. Even on social media, people aren’t expressing any surprise over his joining the politics,” he added. Shah Faesal hails from a remote village in frontier district Kupwara of Kashmir. He topped the IAS exam in 2010 and was allotted the home cadre of Jammu and Kashmir where he worked as District Magistrate, Director of School Education and Managing Director of the state-owned Power Development Corporation. According to unconfirmed reports, Faesal will be contesting from the North Kashmir parliamentary constituency which was won by the Peoples Democratic Party’s Muzaffar Hussain Baig in the 2014 general elections. 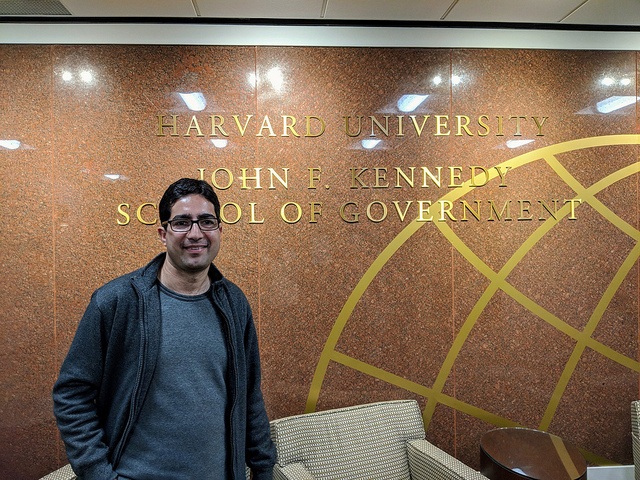 At the time of his resignation, Faesal was on leave, pursuing a master’s degree as a Mason fellow at Harvard University. “He applied for voluntary retirement the day before but the process takes time since it has to be approved by the home ministry,” reports said. Mohammad Saleem, a Banker, believes that Faesal could have served the society better by continuing with his job for a few more years. “Now he will be like any other ‘disempowered’ Kashmiri politician. To protest civilian killings, if he had just tweeted about the same it would have made headlines not only in national media but international media as well,” he said. Welcoming his decision, People Democratic Parties’ spokesperson Najmu Saqib said that youngsters joining politics is a welcome move and provides a platform of greater public service. “The turbulent times’ state is undergoing a new generation of leaders need to rise to the occasion. The present status quo of retaliating violence with violence is untenable and calls for a comprehensive dialogue with all stakeholders at the earliest. We hope the decision is taken out of conviction and not convenience,” he said. Dr Muneeb Faiq, a highly acclaimed clinical researcher from Kashmir said while a cynical approach to anyone’s intents is not wise, it is hard to guess why Dr. Shah Faesal decided to cease to relish Indian bureaucracy. “If he has got some realization, howbeit, that it should be welcome. But if he is giving up one government post to fight for a bigger one, then this will hardly make much of a difference to Kashmir and Kashmiris. If he thinks that he can do some good which he yearned to (but could not) while being a celebrated pen pusher he has every right to try his hand through an unconventional promotion also. His future actions will reveal the truth behind this roster-synchronized resolution,” said Faiq. Last year, Faesal found himself in trouble when the government sent a notice to him for his tweet on rapes in India. “You have allegedly failed to maintain absolute honesty and integrity in the discharge of official duty and thus acted in a manner unbecoming of a public servant,” read the notice by the J&K General Administration Department, which initiated disciplinary proceedings against Faesal at the request of the central government’s Department of Personnel and Training. The other paradox, Zaffar explains, is that he (Faesal) acknowledged in his recent article in Indian express that pro-India band of politicians is not the true representative of people of Kashmir. “I fail to understand how he is going to adjust himself among those career politicians who carry no moral compass,” Zaffar added. Welcoming Faesal to the “fold of politicians”, former J&K Chief Minister Omar Abdullah said, “The bureaucracy’s loss is politics’ gain” in a tweet. “Actually, I welcomed him to the fold of politicians. His future political plans are his to announce,” Omar said in another tweet while responding to reports that Faesal was likely to join National Conference. Faesal said he will reveal his future plans in a press conference on Friday.